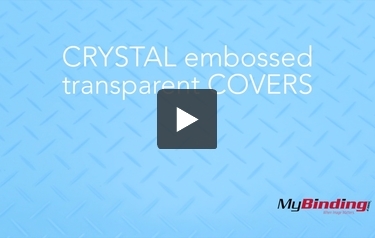 These are Crystal Embossed Transparent Covers! First, you can find these covers in 4 different colors: red, white, blue, and gray. Using your own binding machine, punch these covers to bind a book with any punch pattern you prefer. As you can see, they are clear, and give your book a little extra flair! You can also get them oversized with rounded corners, even in half sized covers. The embossing on these covers give a similar effect to certain metal grates.